These days there are so many TV commercials and print ads from dental practices offering better smiles in one day, quick crowns and help with sleep apnea. Full service dental practices are the most desired but TV ads are often missed and print ads are only good for one or two days at the most. That’s why Mt. 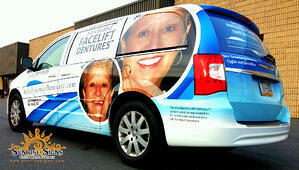 Holly Family Dentistry chose the best way to advertise their services—Chrysler Town & Country van wraps!